LAMP stack (Linux, Apache, MySQL, and PHP) is the widely used stack to host a simple to large websites. If you think the above combination will only be installed on servers where the hosting is made, then that is wrong you can setup LAMP stamp on your PC which has Linux. The installation procedure of the LAMP stack on Ubuntu is quite simple when compared to other Linux environment. In other Linux environment, you need to install packages separately, one by one. But in Ubuntu, you can install the whole stack in the single command. Here, we will see both ways of installing LAMP stack on Ubuntu 18.04. You would get MySQL 5.7 as a database when you install LAMP stack using the single command. But, at the same time, if you choose to install LAMP stack manually, then you will be guided to install MariaDB 10.1 as a database. 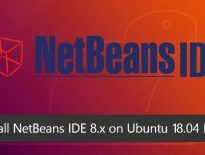 Here is the guide about the Step by Step installation of Ubuntu 18.04 and Upgrading Ubuntu 16.04 LTS to Ubuntu 18.04 LTS. 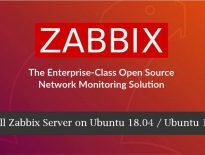 Now, we will proceed to install AMP (Apache version 2.4, PHP version 7.2, MariaDB version 10.1) on Ubuntu 18.04. Update the package repository index. Install apache2 package using the apt command. We will now test the Apache web server to confirm whether it is working correctly. Open up any web browser and then navigate it to the following URL. 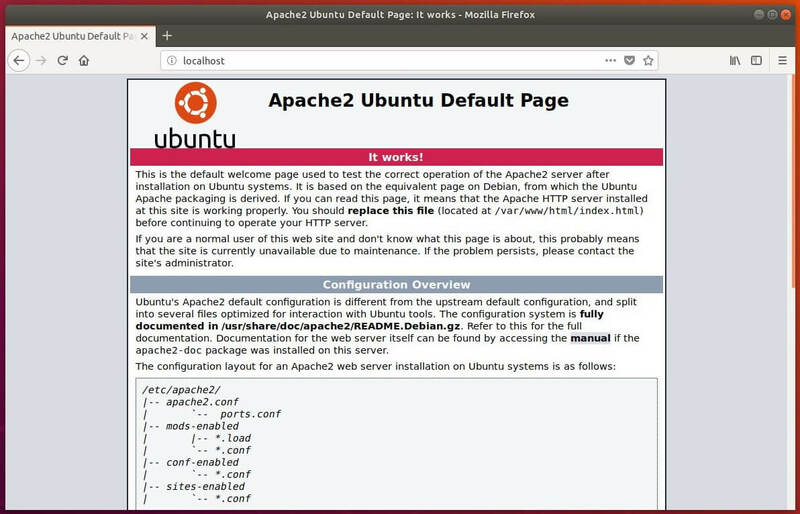 You will get the “Apache2 Ubuntu Default Page“, and this default page confirms you that the Apache HTTP server is working fine. Apache web server’s default document root is /var/www/html/ on Ubuntu and the main configuration file is /etc/apache2/apache2.conf. Additional configuration files can be found in the /etc/apache2/*.enabled directory. The directory hierarchy as follows. By default Apache server supports the .html only, not PHP. To get a PHP supprt, you would need to install PHP and the PHP extension package for MariaDB. 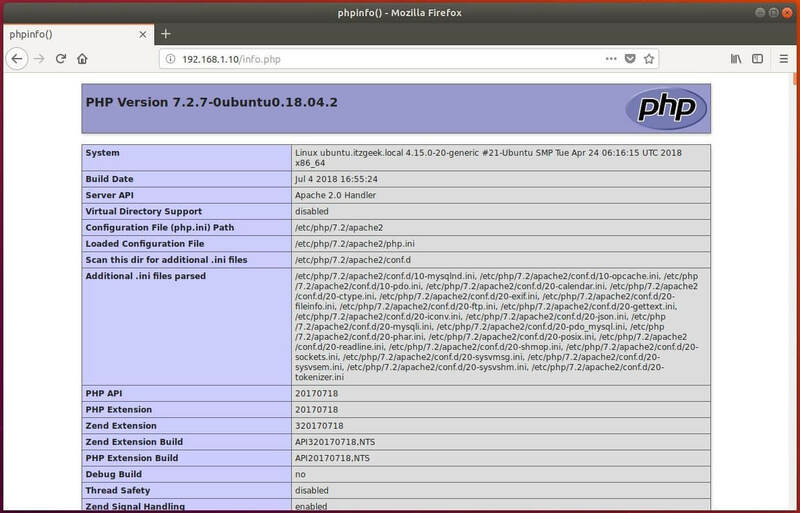 Here, we will install PHP 7.2 on Ubuntu 18.04. 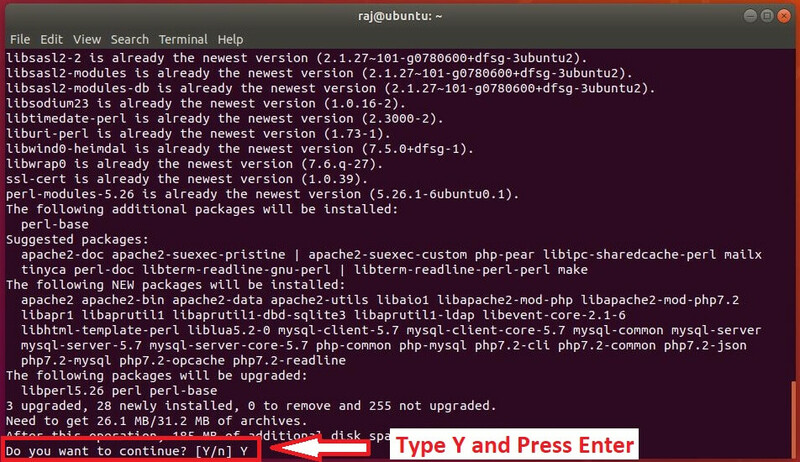 Restart the Apache HTTP server after the installation of the PHP package. Now, skip to Testing LAMP Stack. Now, we will proceed to install AMP (Apache version 2.4, PHP version 7.2, MySQL 5.7) on Ubuntu 18.04. Update the repository cache using the apt command. Paste below the line in the terminal and hit enter. The above command will search and install the required packages for LAMP server. You should see messages something like below. Wait for 10 to 15 minutes to let the installation LAMP stack complete. Then, check the status of the Apache and MySQL service. Jul 23 13:58:20 server.itzgeek.local systemd: Stopped LSB: Apache2 web server. Jul 23 13:58:21 server.itzgeek.local systemd: Started LSB: Apache2 web server. Jul 23 14:17:19 server.itzgeek.local systemd: Stopped MySQL Community Server. Jul 23 14:17:20 server.itzgeek.local systemd: Started MySQL Community Server. Before testing Apache, restart the Apache service. Open up any web browser and then go to the following web address. You should get the following page, and this confirms that Apache web server is working fine. Apache’s default document root is /var/www/html on Ubuntu, and the main configuration file is /etc/apache2/apache2.conf. For testing the PHP, we will place one PHP file on to the default document root of Apache. The page will look like below. Scroll the page down to see the PHP extensions information including MySQL.